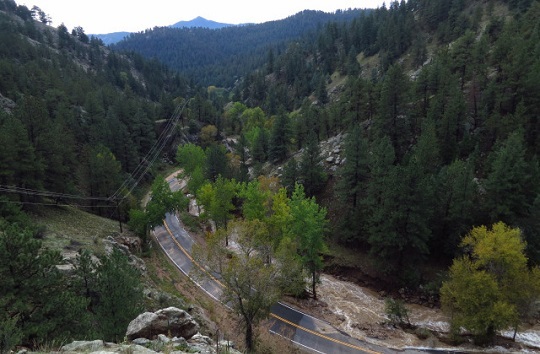 Photos taken by Scott Bennett of Fourmile Canyon, north of Boulder. 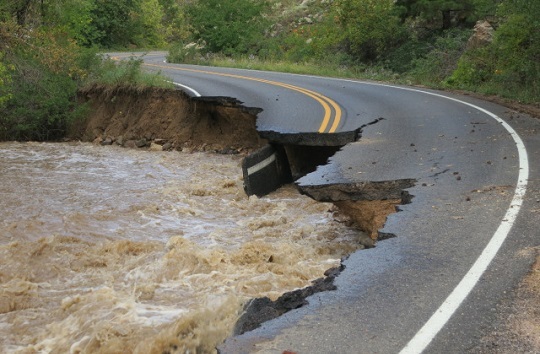 Erosion from the floods late last month caused several road closures and has limited access to climbing along the Front Range of Colorado. 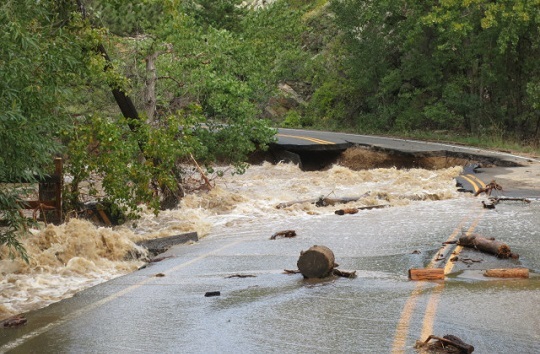 Colorado climbing areas and their access roads are in various states of disarray after floods overwhelmed drainages along the Front Range late last month. According to the National Oceanic and Atmospheric Administration (NOAA), between 7 and 18 inches of rain fell in just over a week's time. The storm, which began on September 11, amounted to "almost nine times [Boulder's] average September monthly rainfall," the Weather Channel reported, and left eight people confirmed dead. 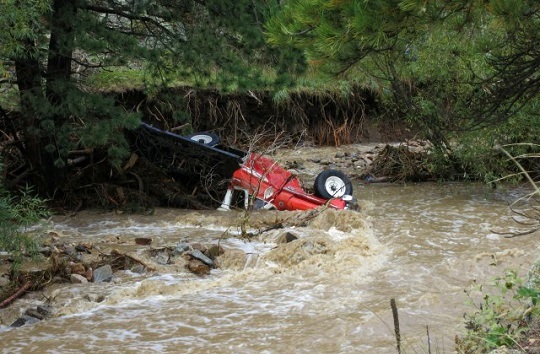 Close to 2,000 homes were damaged or destroyed, and many roads completely washed out. For the state's climbing, this means lots of closures and muddy approaches. Under the leadership of the Boulder Climbing Community (BCC), the American Alpine Club, the Access Fund, the American Mountain Guides Association, the Flatirons Climbing Council and the Action Committee of Eldorado have organized a club consortium to begin restoring the area's climbing access. In an October 3 press release, BCC Operations Manager Roger Briggs wrote, "All of Boulder's most important climbing locations have been shut down for more than two weeks." With the crags of the state in varying conditions of destruction, it will be many months before Colorado's climbing returns to normal. Eldorado State Park, says Park Interpreter Constance Roth, is closed to the public and will likely be for several months. Although the area's climbing trails are in relatively good shape, the road through the park is washed out in several places, like at the base of the Bastille formation, making it impossible to access many areas for maintenance. Because many private residences are located beyond the park, local electric and water companies, with the help of the park, will fund and carry out repairs to the road. There was not even partial access for climbers at press time. On Thursday, September 26, Rocky Mountain National Park officials announced that 93 percent of the park had been reopened to the public and could be accessed via Highway 34 through Granby, Colorado. However, because of the October 1 government shutdown, all National Parks are now closed, including RMNP. 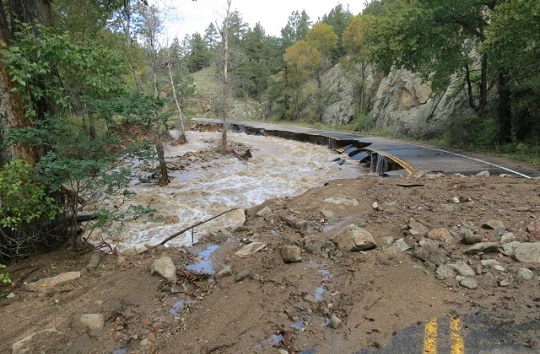 Park official Larry Frederick updated us last week on the conditions of the RMNP's rebuild, saying that workers were finishing up the initial stabilization phase, during which the strength of roads and buildings was assessed. Once the furlough ends, park employees will focus on the second stage of the rebuild, a more extensive recovery of trails and roads. This stage will likely last well in to 2014, says Frederick, and getting a budget plan passed by Congress will be instrumental. In the meantime, visitors should be aware that the park will take significant time to rebuild after the flood. Boulder Canyon's crags are all inaccessible. Highway 119 is completely closed, and officials stated in a September 26 press release that it was slated to reopen in mid- to late October. BCC's Briggs expressed concern about the extent of damage to the climbing areas within the canyon, estimating that the rebuilding efforts in this area will likely account for 90 percent of the entire reconstruction effort in the Boulder area. Briggs is working to organize an assessment walk-through scheduled for next week, but sites the recent government shutdown as a major roadblock. Because the walk-through requires the accompaniment of Forest Service officials (who are furloughed as of October 1), progress is slow. As of October 1, the First Flatiron is open for climbing. Briggs stated that Boulder officials are moving forward the best that they can, and a reopening of the other Flatirons is expected in the near future. Further north, Big Thompson Canyon's climbing is inaccessible, with officials estimating damage to 80 percent of the road. Although sections of Highway 34 are scheduled to open throughout October, some residents with homes in the area have been told it could be up to a year before they are allowed reentry. Jason Haas, author of South Platte Climbing, said October 3 that damage to the South Platte has been minimal in comparison with other areas. Although there were some changes to climbers' trails, access is still available. Overall, the flood of 2013 will have an impact on Colorado's climbing for years to come. Although there has been a torrent of volunteer interest, Briggs stated that it has been a challenge to organize everyone into a single channel. Donations to the effort are being focused towards trail building and can be made through the BCC's website. As of October 12, Rocky Mountain National park has temporarily reopened its gates to the tune of $40,000 per day. The park is currently operating on funds appropriated from Colorado's tourism budget. The governor's office stated that they may ultimately seek reimbursement for these funds. "The economic impact of closing Rocky Mountain National Park has been extremely tough on Estes Park and Grand Lake, local businesses, neighbors, and partners, particularly after the historic floods on the east side of the park and surrounding communities," park officials said in a statement. Locals predict that the park's reopening will provide benefit to the local tourist economy. Bear Lake Road, Moraine Park and Horseshoe Park are all open, with Trail Ridge Road opening as soon as it can be plowed.